Mark Zuckerberg has pledged to devote 2018 to "fixing" Facebook. Now the Facebook CEO is kicking off the effort with a move he says is intended to boost the well-being of users, possibly at the expense of the well-being of publishers and other businesses. Facebook (FB) said late Thursday it is changing the News Feed to prioritize posts from friends, family members and groups over posts from publishers and brands. The company will elevate posts that ignite conversations and meaningful interactions between friends while demoting the many videos, news stories and business posts that users consume passively -- without commenting and sharing. 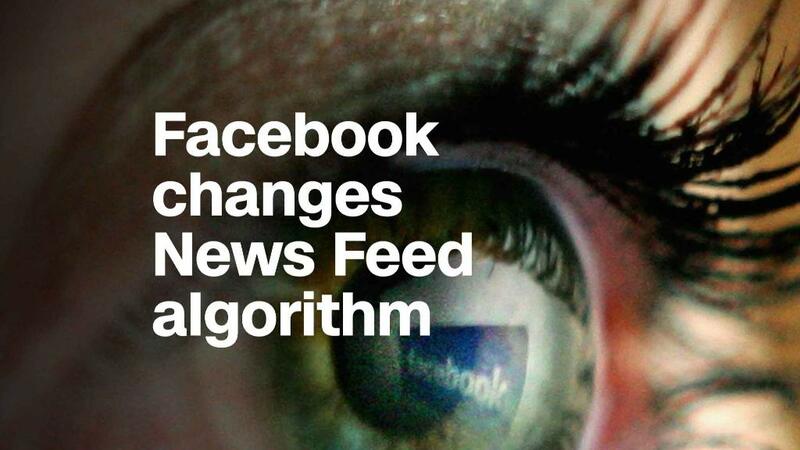 In an exclusive video interview with CNN Tech's Laurie Segall, Facebook VP Adam Mosseri described the move as a "rebalancing" of how Facebook's algorithms rank items in the main feed. "We think that we're currently slightly overvaluing how much time people spend on our platform and undervaluing how many meaningful interactions they have with other people," said Mosseri, who oversees News Feed. "As we roll this out, you'll see less public content like posts from businesses, brands, and media," Zuckerberg said. With more than two billion monthly users, any change Facebook makes can be a seismic event. This move, in particular, has the potential to rattle countless publishers and brands who rely on the social network to distribute and promote content. Mosseri said Facebook will "continue to value publisher content." But the pressure will be on publishers and brands to create content that generates conversations if they want to improve their odds of being seen in News Feed. Unsurprisingly, businesses may be able to sidestep this shift by putting money behind their content. Mosseri says the change "shouldn't affect ads in general" as this operates on a "separate system." The announcement comes amid a broader shift at Facebook. It is, it says, focusing on the quality of connections and content on its platform after a bruising year of stories about fake news, foreign election meddling, filter bubbles and social media addiction. Zuckerberg said earlier this month that his personal goal for 2018 would be to focus on "fixing" many of these existential issues, including "making sure that time spent on Facebook is time well spent." Zuckerberg repeated that sentiment in his post Thursday. "By making these changes, I expect the time people spend on Facebook and some measures of engagement will go down. But I also expect the time you do spend on Facebook will be more valuable." If the last year has shown anything, however, it's that seemingly banal product decisions can yield tremendous unforeseen consequences. By prioritizing content that sparks conversations, Facebook could risk promoting more polarizing and opinionated posts that generate lots of comments, only adding to the filter bubble. Mosseri argues the change could actually help improve the filter bubble issue by showcasing more of what your friends are sharing rather than the publishers you've chosen to follow. "You pick a publisher based on your interests, which are more correlated with your beliefs... You pick a friend for lots of different reasons," he said. "Because this [change] is naturally good for friend content and for conversation, it's actually going to be good for the diversity of opinion in News Feed." News Feed is the centerpiece of the social network. Items in the feed are ranked by an algorithm that takes into account factors like how recent the post is, likes, comments, clickbait and more. Facebook frequently tweaks this ranking algorithm. Mosseri says the company always tries to test these changes with a small percentage of users before rolling it out broadly to ensure the updates "behave as intended."